For the Roman god, see Orcus (mythology). For other uses, see Orcus (disambiguation). 90482 Orcus (/ˈɔːrkəs/ OR-kəs), provisional designation 2004 DW, is a trans-Neptunian object with a large moon, Vanth. With a diameter of 917 km (570 mi), it is a possible dwarf planet. It was discovered on 17 February 2004, by American astronomers Michael Brown of Caltech, Chad Trujillo of the Gemini Observatory, and David Rabinowitz of Yale University. Precovery images taken by the Palomar Observatory as early as 8 November 1951 were later obtained from the Digitized Sky Survey. Orcus is a plutino, a trans-Neptunian object that is locked in a 2:3 resonance with the ice giant Neptune, making two revolutions around the Sun to every three of Neptune's. This is much like Pluto, except that it is constrained to always be in the opposite phase of its orbit from Pluto: Orcus is at aphelion when Pluto is at perihelion and vice versa. Moreover, the aphelion of Orcus's orbit points in nearly the opposite direction from Pluto's, although the eccentricities and inclinations are similar. Because of these similarities and contrasts, along with its large moon Vanth that recalls Pluto's large moon Charon, Orcus has been regarded as the anti-Pluto. This was a major consideration in selecting its name, as the deity Orcus was the Etruscan equivalent of the Roman Pluto, and later became an alternate name for Pluto. The surface of Orcus is relatively bright with albedo reaching 23 percent, neutral in color and water-rich. The ice is predominantly in crystalline form, which may be related to past cryovolcanic activity. Other compounds like methane or ammonia may also be present. The existence of a satellite allowed astronomers to determine the mass of the system, which is approximately equal to that of the Saturnian moon Tethys. The ratio of masses of Orcus and Vanth is uncertain, possibly anywhere from 1:33 to 1:12. The diameter of Orcus is estimated to be about 920 km (570 mi) and the diameter of Vanth about 276 km (171 mi) respectively, assuming similar albedo values for the primary and the satellite. A spatially resolved submillimeter imaging of Orcus–Vanth system in 2016 showed that Vanth has a relatively large size of 920 km (570 mi), with an uncertainty of 75 km (47 mi). The size of the primary becomes slightly smaller at 910 km (570 mi). That estimate for Vanth is in good agreement with the size of about 442.5 km (275.0 mi) derived from a stellar occultation in 2017. The minor planet Orcus was named after one of the Roman gods of the underworld, Orcus. While Pluto was the ruler of the underworld, Orcus was a punisher of the condemned. The approved naming citation was published by the Minor Planet Center on 26 November 2004 (M.P.C. 53177). Under the guidelines of the International Astronomical Union's (IAU) naming conventions, objects with a similar size and orbit to that of Pluto are named after underworld deities. Accordingly, the discoverers suggested naming the object after Orcus, the Etruscan god of the underworld and punisher of broken oaths. He was portrayed in paintings in Etruscan tombs as a hairy, bearded giant. The name was also a private reference to the homonymous Orcas Island, where Brown's wife Diane had lived as a child and that they visit frequently. On 30 March 2005, Orcus's moon, Vanth, was named after a winged female demon of the Etruscan underworld. She could be present at the moment of death, and frequently acted as a guide of the deceased to the underworld. Orcus compared to Earth and the Moon. The absolute magnitude of Orcus is approximately 2.3. The detection of Orcus by the Spitzer Space Telescope in the far infrared and by Herschel Space Telescope in submillimeter constrains its diameter to 958.4 kilometres (595.5 mi), with an uncertainty of 22.9 kilometres (14.2 mi). Orcus appears to have an albedo of about 21 percent to 25 percent, which may be typical of trans-Neptunian objects approaching the 1,000 km (620 mi) diameter range. The magnitude and size estimates were made under the assumption that Orcus is a singular object. The presence of a relatively large satellite, Vanth, may change them considerably. The absolute magnitude of Vanth is estimated at 4.88, which means that it is about 11 times fainter than Orcus itself. If the albedos of both bodies are the same at 23 percent, the estimated size of Orcus is about 917 km (570 mi), and the size of Vanth is about 276 km (171 mi). The ALMA submillimeter measurements taken in 2016 showed that Vanth has a relatively large size of 475 km (295 mi) with albedo of about 8 percent while Orcus's has a slightly smaller size of 910 km (570 mi). Using a stellar occultation by Vanth in 2017, Vanth's diameter has been determined to be 442.5 km (275.0 mi), with an uncertainty of 10.2 km (6.3 mi). Mike Brown's website lists Orcus as a dwarf planet with "near certainty", Tancredi concludes that it is one, and is massive enough to be considered one under the 2006 draft proposal of the IAU, but the IAU has not formally recognized it as such. Since Orcus is known to be a binary system, the mass of the system has been estimated to be 7020632000000000000♠(6.32±0.05)×1020 kg, or about 3.8 percent the mass of the most massive known dwarf planet, Eris. How this mass is partitioned between Orcus and Vanth depends of their relative sizes. If Vanth's diameter is about one third that of Orcus, its mass is only 3 percent of the system mass. On the other hand, if the size of Vanth is about half that of Orcus, then its mass could be as high as 1/12 of the system mass, or about 8 percent of the mass of Orcus. The density of the Orcus (and Vanth assuming the same density) is about 1.53 g/cm3. The first spectroscopic observations in 2004 showed that the visible spectrum of Orcus is flat (neutral in color) and featureless, whereas in the near-infrared there were moderately strong water absorption bands at 1.5 and 2.0 μm. The neutral visible spectrum and strong water absorption bands of Orcus showed that Orcus appeared different from other trans-Neptunian objects, which typically have a red visible spectrum and often featureless infrared spectra. Further infrared observations in 2004 by the European Southern Observatory and the Gemini telescope gave results consistent with mixtures of water ice and carbonaceous compounds, such as tholins. The water and methane ices can cover no more than 50 percent and 30 percent of the surface, respectively. This means the proportion of ice on the surface is less than on Charon, but similar to that on Triton. Later in 2008–2010 new infrared spectroscopic observations with a higher signal-to-noise ratio revealed additional spectral features. Among them are a deep water ice absorption band at 1.65 μm, which is an evidence of the crystalline water ice on the surface of Orcus, and a new absorption band at 2.22 μm. The origin of the latter feature is not completely clear. It can be caused either by ammonia/ammonium dissolved in the water ice or by methane/ethane ices. The radiative transfer modeling showed that a mixture of water ice, tholins (as a darkening agent), ethane ice and ammonium ion (NH4+) provides the best match to the spectra, whereas a combination of water ice, tholins, methane ice and ammonia hydrate gives a slightly inferior result. On the other hand, a mixture of only ammonia hydrate, tholins and water ice failed to provide a satisfactory match. So, as of 2010, the only reliably identified compounds on the surface of Orcus are crystalline water ice and, possibly, dark tholins. A firm identification of ammonia, methane and other hydrocarbons requires better infrared spectra. Orcus straddles the edge for trans-Neptunian objects massive enough to retain volatiles such as methane on the surface. The reflectance spectrum of Orcus shows the deepest water-ice absorption bands of any Kuiper belt object that is not associated with the Haumea collisional family. The large icy satellites of Uranus have infrared spectra quite similar to that of Orcus. Among other trans-Neptunian objects, the large plutino 2003 AZ84 and Pluto's moon Charon both have similar surface spectra to Orcus. Both bodies have a flat featureless visible spectrum and moderately strong water ice absorption bands in the near-infrared, similarly to that of Orcus. The presence of crystalline water ice, and possibly ammonia ice may indicate that a renewal mechanism was active in the past on the surface of Orcus. Ammonia so far has not been detected on any trans-Neptunian object or icy satellite of the outer planets other than Miranda. The 1.65 μm band on Orcus is broad and deep (12%), as on Charon, Quaoar, Haumea, and icy satellites of giant planets. On the other hand, the crystalline water ice on the surfaces of trans-Neptunian objects should be completely amorphized by the galactic and Solar radiation in about 10 million years. Some calculations indicate that cryovolcanism, which is considered one of the possible renewal mechanisms, may indeed be possible for trans-Neptunian objects larger than about 1,000 km (620 mi). Orcus may have experienced at least one such episode in the past, which turned the amorphous water ice on its surface into crystalline. The preferred type of volcanism may have been explosive aqueous volcanism driven by an explosive dissolution of methane from water–ammonia melts. Models of internal heating via radioactive decay suggest that Orcus may be capable of sustaining an internal ocean of liquid water. Mean-motion resonance of Orcus rotating frame with a period equal to Neptune's orbital period. The orbits of Orcus (blue), Pluto (red) and Neptune (grey). Orcus and Pluto are shown in the April 2006 positions. The dates of their perihelia (q) and aphelia (Q) are also marked. Orcus is in 2:3 orbital resonance with Neptune, having an orbital period of 247 years. Orcus's orbit is similar to Pluto's (both have perihelia above the ecliptic), but is oriented differently. Although at one point its orbit approaches that of Neptune, the resonance between the two bodies means that Orcus itself is always a great distance away from Neptune (there is always an angular separation of over 60 degrees between them). Over a 14,000-year period Orcus stays more than 18 AU from Neptune. Because their mutual resonance with Neptune constrains Orcus and Pluto to remain in opposite phases of their otherwise very similar motions, Orcus is sometimes described as the "anti-Pluto". Orcus is currently 48.0 AU from the Sun and will come to aphelion (farthest distance from the Sun) in 2019. Simulations by the Deep Ecliptic Survey show that over the next 10 million years Orcus can acquire a perihelion distance (qmin) as small as 27.8 AU. The rotation period of Orcus is uncertain, as different photometric surveys have produced different results. Some show low amplitude variations with periods ranging from 7 to 21 hours, whereas others show no variability. However, the value obtained by Ortiz et al., about 10.5 hours, seems to be the most likely one. The rotational poles of Orcus probably coincide with the orbital poles of its moon, Vanth. This means that Orcus is currently viewed pole-on, which could explain the near absence of any rotational modulation of its brightness. If, however, the primary is tidally locked with the satellite, the rotational period will coincide with the 9.7-day orbital period of Vanth. Orcus has one known moon, Vanth (full designation (90482) Orcus I Vanth). It was discovered by Mike Brown and T.-A. Suer using discovery images taken by the Hubble Space Telescope on 13 November 2005. The discovery was announced on 22 February 2007 in IAU Circular 8812. Using observations with the Hubble Space Telescope from 13 November 2005, Mike Brown and T. A. Suer detected a natural satellite. The discovery of a satellite of Orcus was reported in IAUC 8812 on 22 February 2007. The satellite was given the designation S/2005 (90482) 1 before later being named Vanth. It orbits Orcus in a nearly face-on circular orbit with an eccentricity of about 0.007, and an orbital period of 9.54 days. Vanth orbits only 9,030 km (5,610 mi) from Orcus and is too close to Orcus for ground-based spectroscopy to determine the surface composition of the satellite. Mike Brown suspects that like the Pluto–Charon system, Orcus and Vanth are tidally locked. Vanth does not resemble known collisional satellites because its spectrum is very different from that of its primary, and it may be a captured Kuiper belt object. Vanth could also have originated as a result of rotational fission of the primordial Orcus, which would have rotated much faster than now. On 23 March 2009, Brown asked readers of his weekly column to suggest possible names for the satellite, with the best one to be submitted to the International Astronomical Union (IAU) on 5 April. The name Vanth, after the Etruscan goddess who guided the souls of the dead to the underworld, was eventually chosen from among a large pool of submissions. This submission was assessed by the IAU's Committee for Small Body Nomenclature, which voted to approve it in March 2010, in accordance with the normal object naming procedures. −0.01, almost 3 times darker than Orcus. For 7 March 2017, a stellar occultation by Orcus had been predicted to take place in the Americas and over the Pacific Ocean. Observations were made at five sites in North and South America, and two solid body chords have been observed. Using speckle imaging, the occulted star was revealed to be a close double star, and a reconstruction of the orbits of Orcus and Vanth showed that both chords were from Vanth (occulting either of the two stars) rather than Orcus. A non-detection at a nearby site placed a constraint of 7005442500000000000♠442.5±10.2 km (7005274900000000000♠274.9±6.3 km) on the diameter of Vanth. The occultation data is consistent with a pressure of at most 4 microbar for a global atmosphere of Vanth. Vanth does not resemble other known collisional satellites because its spectrum is very different from that of its primary. Vanth may thus be a captured Kuiper belt object. In that respect, it may be similar to the satellite of the large trans-Neptunian object (225088) 2007 OR10, which also has a very different colour compared to its primary. Upon discovery, Vanth was issued a provisional designation, S/2005 (90482) 1. On 23 March 2009, Brown asked readers of his weekly column to suggest possible names for the satellite, with the best one to be submitted to the International Astronomical Union (IAU) on 5 April. The name Vanth, the winged Etruscan psychopomp who guides the souls of the dead to the underworld, was chosen from among a large pool of submissions. Vanth was the only suggestion that was purely Etruscan in origin. It was the most popular submission, first suggested by Sonya Taaffe. This submission was assessed and approved by the IAU's Committee for Small Body Nomenclature in their 30 March 2010 circular. The Etruscan Vanth is frequently portrayed in the company of Charun (Charon), and so as the name of the moon of Orcus (nicknamed the "anti-Pluto" because resonance with Neptune keeps it on the opposite side of the Sun from Pluto), it is an allusion to the parallels between Orcus and Pluto. Brown quoted Taaffe as saying that if Vanth "accompanies dead souls from the moment of death to the underworld itself, then of course her face is turned always toward Orcus", a reference to the likely synchronous orbit of Vanth about Orcus. ^ a b c "JPL Small-Body Database Browser: 90482 Orcus (2004 DW)" (2017-03-01 last obs.). Jet Propulsion Laboratory. Retrieved 28 June 2017. ^ a b "90482 Orcus (2004 DW)". Minor Planet Center. Retrieved 3 April 2017. ^ Schmadel, Lutz D. (2006). "(90482) Orcus [39.5, 0.22, 20.5]". Dictionary of Minor Planet Names – (90482) Orcus, Addendum to Fifth Edition: 2003–2005. Springer Berlin Heidelberg. p. 236. doi:10.1007/978-3-540-34361-5_2818. ISBN 978-3-540-34361-5. ^ a b c d Buie, Marc W. (22 December 2007). "Orbit Fit and Astrometric record for 90482". SwRI (Space Science Department). Retrieved 19 September 2008. ^ "MPEC 2009-E53 :Distant Minor Planets (2009 MAR. 30.0 TT)". Minor Planet Center. 11 March 2009. Retrieved 5 July 2011. ^ a b Michael E. Brown (23 Sep 2011). "How many dwarf planets are there in the outer solar system? (updates daily)". California Institute of Technology. Archived from the original on 18 October 2011. Retrieved 23 September 2011. ^ a b c d e f g h i j k Fornasier, S.; Lellouch, E.; Müller, P., T.; et al. (2013). 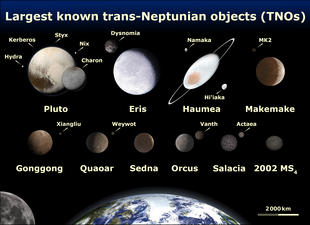 "TNOs are Cool: A survey of the trans-Neptunian region. VIII. Combined Herschel PACS and SPIRE observations of 9 bright targets at 70–500 µm". Astronomy & Astrophysics. 555: A92. arXiv:1305.0449v2. Bibcode:2013A&A...555A..15F. doi:10.1051/0004-6361/201321329. ^ a b c d e f Brown, Michael E.; Butler, Bryan J. (22 January 2018). "Medium-sized satellites of large Kuiper belt objects". The Astronomical Journal. 156 (4): 164. arXiv:1801.07221. doi:10.3847/1538-3881/aad9f2. ^ a b c d e f g h Carry, B.; Hestroffer, D.; Demeo, F. E.; Thirouin, A.; Berthier, J.; Lacerda, P.; Sicardy, B.; Doressoundiram, A.; Dumas, C.; Farrelly, D.; Müller, T. G. (2011). "Integral-field spectroscopy of (90482) Orcus-Vanth". Astronomy & Astrophysics. 534: A115. arXiv:1108.5963. Bibcode:2011A&A...534A.115C. doi:10.1051/0004-6361/201117486. ^ a b c d e f g h i Barucci, M. A.; Merlin; Guilbert; Bergh; Doressoundiram; et al. (2008). "Surface composition and temperature of the TNO Orcus". Astronomy and Astrophysics. 479 (1): L13–L16. Bibcode:2008A&A...479L..13B. doi:10.1051/0004-6361:20079079. ^ a b Carry 2011, Table 4. ^ a b c de Bergh, C.; A. Delsanti; G. P. Tozzi; E. Dotto; A. Doressoundiram; M. A. Barucci (2005). "The Surface of the Transneptunian Object 9048 Orcus". Astronomy & Astrophysics. 437 (3): 1115–1120. Bibcode:2005A&A...437.1115D. doi:10.1051/0004-6361:20042533. ^ a b "AstDys (90482) Orcus Ephemerides". Department of Mathematics, University of Pisa, Italy. Retrieved 19 March 2009. ^ a b "HORIZONS Web-Interface". JPL Solar System Dynamics. Retrieved 2 July 2008. ^ a b c d e f g h i j k l m Brown, M.E. ; Ragozzine, D.; Stansberry, J.; Fraser, W.C. (2010). "The size, density, and formation of the Orcus-Vanth system in the Kuiper belt". The Astronomical Journal. 139 (6): 2700–2705. arXiv:0910.4784. Bibcode:2010AJ....139.2700B. doi:10.1088/0004-6256/139/6/2700. ^ a b "MPEC 2004-D15 : 2004 DW". Minor Planet Center. 20 February 2004. Retrieved 5 July 2011. ^ a b c d e f g h Michael E. Brown (23 March 2009). "S/2005 (90482) 1 needs your help". Mike Brown's Planets (blog). Archived from the original on 28 March 2009. Retrieved 25 March 2009. ^ a b c d e Sickafoose, A.A.; Bosh, A.S.; Levine, S.E. ; Zuluaga, C.A. ; Genade, A.; Schindler, K.; Lister, T.A. ; Person, M.J. (21 October 2018). "A stellar occultation by Vanth, a satellite of (90482) Orcus". Icarus. 319: 657–668. arXiv:1810.08977. doi:10.1016/j.icarus.2018.10.016. ^ "MPC/MPO/MPS Archive". Minor Planet Center. Retrieved 3 April 2017. ^ a b c d Michael E. Brown (6 April 2009). "Orcus Porcus". Mike Brown's Planets (blog). Archived from the original on 14 April 2009. Retrieved 6 April 2009. ^ a b Wm. Robert Johnston (4 March 2007). "(90482) Orcus". Johnston's Archive. Archived from the original on 10 February 2009. Retrieved 26 March 2009. ^ Stansberry, J.; Grundy, W.; Brown, M.; Cruikshank, D.; Spencer, J.; Trilling, D.; Margot, J.-L. (2008). "Physical Properties of Kuiper Belt and Centaur Objects: Constraints from the Spitzer Space Telescope". In M. A. Barucci; H. Boehnhardt; D. P. Cruikshank; A. Morbidelli (eds.). The Solar System Beyond Neptune. Tucson: University of Arizona Press. pp. 161–179. Bibcode:2008ssbn.book..161S. ISBN 978-0816527557. ^ Wm. Robert Johnston (17 September 2008). "TNO/Centaur diameters and albedos". Johnston's Archive. Archived from the original on 22 October 2008. Retrieved 17 October 2008. ^ Tancredi, G.; Favre, S. (2008). "Which are the dwarfs in the solar system?" (PDF). Asteroids, Comets, Meteors. Retrieved 28 December 2007. ^ Gingerich, Owen (16 August 2006). "The Path to Defining Planets" (PDF). Harvard-Smithsonian Center for Astrophysics and IAU EC Planet Definition Committee chair. p. 4. Retrieved 13 March 2007. ^ "Planetary Names: Planet and Satellite Names and Discoverers". Gazetteer of Planetary Nomenclature. International Astronomical Union (Working Group for Planetary System Nomenclature). Retrieved 10 June 2012. ^ NASA. "List of Dwarf Planets". Archived from the original on 4 May 2012. Retrieved 9 June 2012. ^ a b Fornasier, S.; Dotto, E.; Barucci, M.A. ; Barbieri, C. (2004). "Water ice on the surface of the large TNO 2004 DW". Astronomy & Astrophysics. 422 (2): L43–L46. Bibcode:2004A&A...422L..43F. doi:10.1051/0004-6361:20048004. ^ a b Trujillo, Chadwick A.; Brown, Michael E.; Rabinowitz, David L.; Geballe, Thomas R. (2005). "Near‐Infrared Surface Properties of the Two Intrinsically Brightest Minor Planets: (90377) Sedna and (90482) Orcus". The Astrophysical Journal. 627 (2): 1057–1065. arXiv:astro-ph/0504280. Bibcode:2005ApJ...627.1057T. doi:10.1086/430337. ^ a b c d e f g h i A. Delsanti; F. Merlin; A. Guilbert–Lepoutre; et al. (2010). "Methane, ammonia, and their irradiation products at the surface of an intermediate-size KBO? A portrait of Plutino (90482) Orcus". Astronomy and Astrophysics. 627 (2): 1057. arXiv:1006.4962. Bibcode:2010A&A...520A..40D. doi:10.1051/0004-6361/201014296. ^ a b c d e Ortiz, J. L.; Cikota, A.; Cikota, S.; Hestroffer, D.; Thirouin, A.; Morales, N.; Duffard, R.; Gil-Hutton, R.; Santos-Sanz, P.; De La Cueva, I. (2010). "A mid-term astrometric and photometric study of trans-Neptunian object (90482) Orcus". Astronomy & Astrophysics. 525: A31. arXiv:1010.6187. Bibcode:2011A&A...525A..31O. doi:10.1051/0004-6361/201015309. ^ a b Daniel W. E. Green (22 February 2007). "IAUC 8812: Sats OF 2003 AZ_84, (50000), (55637),, (90482)". International Astronomical Union Circular. Retrieved 4 July 2011. ^ Wm. Robert Johnston (4 March 2007). "(90482) Orcus". Johnston's Archive. Retrieved 26 March 2009. ^ Daniel W. E. Green (22 February 2007). "IAUC 8812: Sats OF 2003 AZ_84, (50000), (55637), (90482)". International Astronomical Union Circular. Archived from the original on 19 July 2011. Retrieved 7 May 2011. ^ "Committee on Small Body Nomenclature: Names of Minor Planets". Retrieved 8 April 2009. ^ "The MINOR PLANET CIRCULARS/MINOR PLANETS AND COMETS" (PDF). Minorplanetcenter.org\accessdate=12 October 2017. 30 March 2010. ^ Kiss, C.; Marton, G.; Parker, A.; Grundy, W.; Farkas-Takács, A. I.; Stansberry, J.; Pal, A.; Müller, T. G.; Noll, K.; Schwamb, M. E.; Barr Mlinar, A. C.; Young, L. A.; Vinkó, J. (24 October 2018). The mass and density of the dwarf planet 2007 OR10. 50th annual meeting of the AAS Division of Planetary Sciences. abstract 311.02. Retrieved 21 September 2018. ^ "Minor planet circular" (PDF). minorplanetcenter.org. 2010. Retrieved 8 August 2010. Wikimedia Commons has media related to 90482 Orcus.